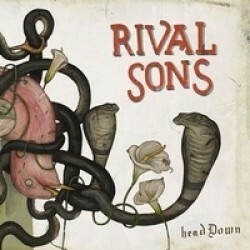 Rival Sons has been conquering the world since their second full length release Pressure & Time. Of course I have listened to this album, but to be honest I didn’t know what the fuzz was about with this band. Sure, it was a good album, but in my opinion not that great earth-shaking album that a lot of people thought it was. With Head Down they have the chance to convince me. The sound of Rival Sons hasn’t changed much. It’s still infused with lots of influences by great bands as Led Zeppelin and Deep Purple and has one foot firmly planted in the seventies Rhythm & Blues. While this hasn’t changed, they have really delivered in the songwriting department and made some serious strides forward. There’s a lot of variation found on this album. From rockers like ‘Keep On Swinging’ and ‘Wild Animal’ to more light-footed songs like ‘Until The Sun Comes’ and even bluesy ballads like ‘Jordan’. All the songs are carried by the phenomenal vocals of Jay Buchanan. What this guy can do with his voice is stellar. He has an excellent passionate blues voice (just listen to one of my favourite songs ‘Run From Revelation’), but he easily switches to a more calm and emotional style or a voice which better suits traditional seventies rock tunes like the Status Quo-like ‘All The Way’. But it’s not only Jay who steals the show. Scott Holiday shows that he changes guitar styles with ease. Rock riffs, blues chops, you name it he can do it. Of course it’s hard to come up with new riffs, since it has all been done before, but he really gives his own touch on things. The rhythm section keeps the songs in check and makes sure that the songs stick in to your brain with the well-crafted rhythms. I especially want to emphasize the drumwork of Michael Miley in the ballad ‘Jordan’. For a drummer it’s easier to show off in an uptempo song, but his laidback style in this song is beautiful. You don’t have to be a very attentive reader to know what I think of this album. 2012 is shaping up to be a superb year for rock and metal and Head Down will strive for a place on my top 10 at the end of the year. Rival Sons has more than convinced me. Hopefully there’s still a spot free on the bandwagon, because I definitely am going to try to jump on it.